Same Day Smile with Teeth in 1 Day Dental Implants. 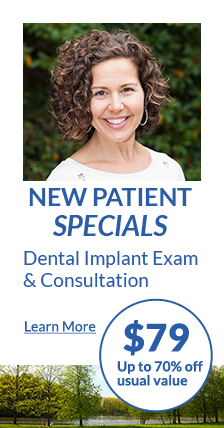 Get extractions, implants and new teeth in the same day! Our doctors can provide you with an immediate solution for complete lower or upper tooth replacement that is as close to natural teeth as is available today. 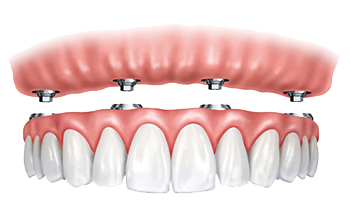 By placing four to six dental implants per arch, we can provide you with a new set of teeth that will be immediately functional. Traditional dentures offer only about a 10% ability to chew normally. With our New Teeth in One Day procedure, you can regain up to 90% of normal chewing power! You will no longer need to worry about slipping dentures and difficulty eating certain foods. Using as few as four dental implants, our doctors can give you a full set of new teeth in one day. We’ll do a 3D scan of your jaw, teeth and gums using our 3D cone beam CT scanner, a state-of-the-art 3D imaging system. The cone beam scanner provides us with a comprehensive, detailed view of anatomical structures of your mouth as well as the contour of your jawbone. This vital information allows us to determine the best location for your dental implants without exploratory surgery. Your doctor will listen carefully to any concerns you may have, explain the treatment thoroughly and answer any questions. Our doctors use 3D images from the CT scan to plan for your implant placement in advance. Using the highly detailed, three-dimensional images from your CT scan, we can plan your implant procedure in advance. The images give us information about the densest areas of bone, and the height and width of available bone. This information allows us to determine the best location and angle for your implants, as well as the optimum size and type of implant post to use. We can also determine if bone grafting will be required to augment your jawbone. Using the three-dimensional images and specialized software, we create a surgical guide for the implant procedure. We use customized surgical guides to precisely place your implant in the predetermined location. The surgical guide is used to precisely position your implants in the predetermined location. This means there is little impact on the gum and bone, making the procedure minimally invasive, and reducing any potential post-operative discomfort. We evaluate each case individually to determine the number of implants required to support a restoration, usually between four to six posts per arch. If we need to extract any teeth, this is done at the time of the implant surgery. You have the option of receiving oral or IV sedation so that you will be fully relaxed. After your implants are in place, you will receive a temporary set of teeth for use until your gum tissues have fully healed and the implants have fully integrated with your jaw. These teeth are fastened to the dental implants are are functional! Three to four months later your permanent teeth will be made and placed. Regularly scheduled professional cleanings are an important part of keeping your dental implants in top condition. In addition to your at-home maintenance program, we recommend 2-4 professional cleanings per year depending on individual patient needs. Our hygienists have been specifically trained to care for dental implants and the surrounding tissue. They use plastic tools designed for implant cleaning that won’t scratch the titanium and attract bacteria. We will also provide you with detailed instructions for caring for your implants at home, and are always available to answer any questions you may have. “Dr. Weingarden has the well earned reputation of being the best periodontist in Pittsburgh. He is not only technically proficient, but also has a terrific manner when dealing with patients. He is courteous and frank when giving explanations, and is also able to “dumb it down” to make it easier for patients to understand.